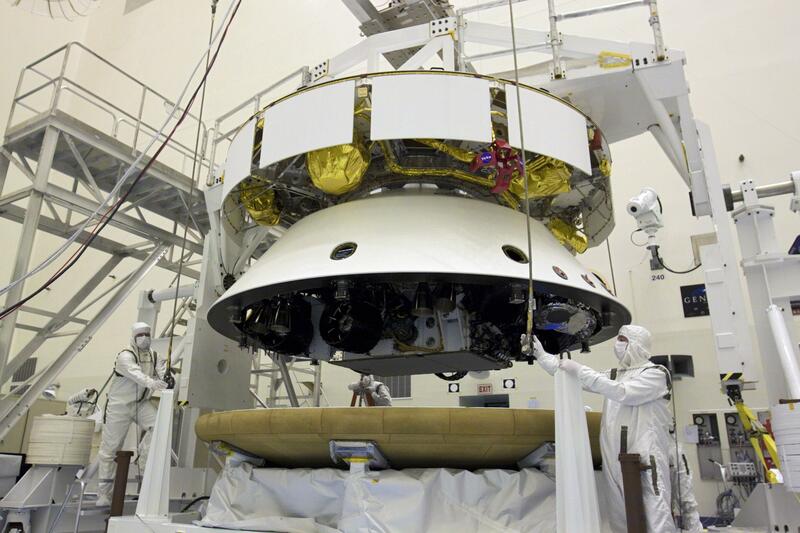 It’s shaping up to be an important week for NASA. Their Mars Curiosity Rover should be touching dirt in Gale Crater by 0631 BST Monday. It’s a powerful beast, carrying about 10 times as much mass as its ancestors, powered by a plutonium-238 thermoelectric power generator. It will combine the camera mounts, six-wheel drive and suspension technology inherited from the Spirit and Opportunity rovers with the ability to conduct onboard sample analysis, scooping up Martian soil and carrying out a series of tests for organic compounds. It will even be able to use a laser to vapourise rocks and study the remains, continually improving our understanding of Mars as a potential ancient habitat. This is no mean feat – just getting a monster the size of Curiosity to the surface requires a finessed landing process. Previous landers have used airbags to soften the impact of landings, but Curiosity is too massive for that. This problem is exacerbated by Mars’ thin atmosphere, providing little air resistance to the capsule hurtling toward the surface. 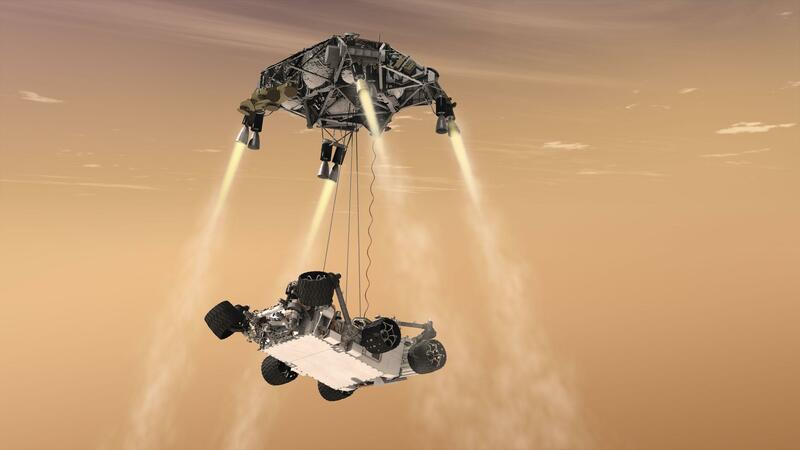 An innovative “sky crane” landing system will require the capsule to slow to a hover above the surface, and then slowly deploy Curiosity to the surface by means of an umbilical tether. Despite such an ambitious plan to reach the Martian surface, NASA have set their mission objectives a little lower than perhaps expected. With such a formidable rover roaming around Gale Crater, it would not have been surprising to hear NASA claim they were searching for living organisms. Instead, they modestly hope to find “the ingredients for life”, a much more likely outcome given the lack of subsurface aquifers originally thought to be there. Previous missions tried and failed to find the aquifers, now consigned to the same dustbin as Schiaparelli’s canals. This throttled-back candour seems to be reflected in all of NASA’s recent decisions. With budgets in seemingly interminable flux, and each administration dreaming of unrealistic resurrection of the manned space program, the agency has been forced to box clever as of late. It is still licking its wounds from the JWST budget scandal, as well as the less public academic backlash from the media circus surrounding missions such as Kepler (see e.g. here). They have the misfortune of two quite disparate audiences to manage expectations for – the nonspecialists, who fund it, and the scientific community, who drive its scientific aims and clarify its most important tasks. Each has their own aims and agenda, and each are disappointed when things “go wrong” according to their beliefs as to what “going right” is. In this thorny environment, NASA’s recent decision to open up manned spaceflight to the private sector is an attempt to walk a difficult tightrope. Outsourcing the cost of the post-Shuttle crew vehicle design and construction is a tick in the box for an impoverished electorate who wish to rein in expenditure in tough times. Scientists will be mollified by the choices of outsourcing. 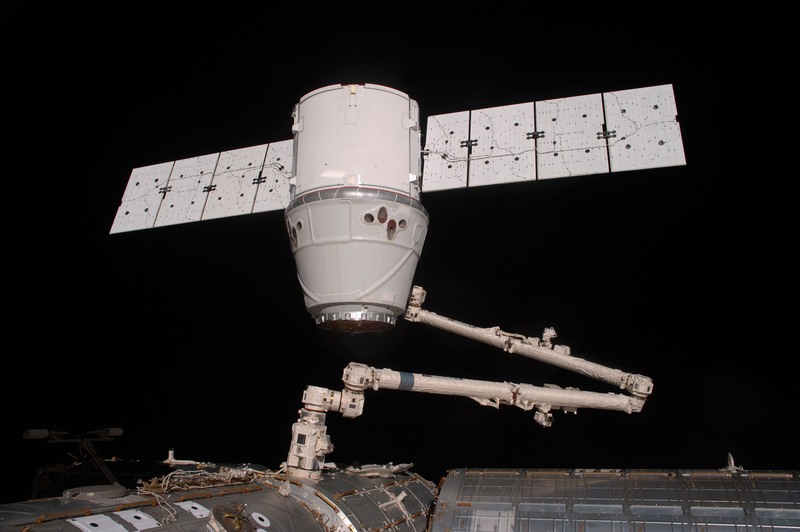 SpaceX’s Dragon (above) has already demonstrated its crew vehicle in an unmanned mission to the International Space Station earlier this year; Boeing’s track record in spaceflight goes all the way back to Apollo; and Sierra Nevada is the inheritor of a previous NASA mini-shuttle design. These three choices are the end of a shortlisting process, with many losers having to go it alone with “commercial” intentions, including Blue Origins, a startup from Amazon’s Jeff Bezos. This cautious, softly-softly approach is to be welcomed in these difficult times. Funding is evanescent in these times, and developing missions with achievable, yet still laudable goals is important. Better still, use the resources in the private sector rather than compete with them. Can We Catch ET in the act of Asteroid Mining? So, seeing as I put myself firmly on the soap box a few posts ago, I should practise what I preach and tell you about my latest astrobiological research. You might be familiar with the idea of biomarkers – the concept that inhabited planets look fundamentally different from uninhabited planets. For example, significant amounts of oxygen in a planet’s atmosphere is a pretty good (if not entirely conclusive) sign that something is continually producing it; otherwise, the oxygen would disappear pretty quickly. Anyway, this is an indication that something interesting is going on there, and we should continue exploring. Biomarkers tell us that there’s a good chance the planet is inhabited by life – noomarkers tell us that a planet or planetary system has intelligent life. What my collaborator Martin Elvis and I were interested in was whether asteroid mining could provide us with a noomarker. Continue reading Can We Catch ET in the act of Asteroid Mining? It’s easy for news like this to get lost in the tumult of global politics, but let me leave the discussion of Egypt and Tunisia to the better-informed and tell you about some interesting astro-news. 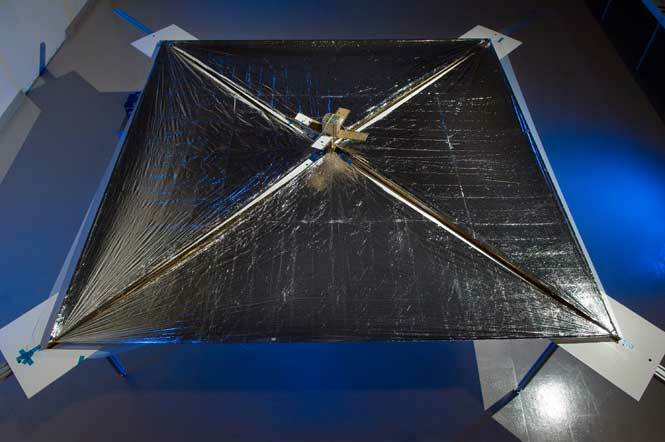 NASA has successfully deployed Nano-Sail D (below), a 100 square foot solar sail in low Earth Orbit. The success of the mission was confirmed by amateur radio operators, who detected its signal beacon at 437.270 MHz. This success follows in the footsteps of the groundbreaking IKAROS mission, which deployed the first ever functioning solar sail to propel it towards Venus, where it flew by last month.